Francesco Nalini, representing our diamond sponsor CAREL, shares his views on the challenges the HVACR industry is facing. Dina Koepke, representing our diamond sponsor Emerson Climate Technologies, shares her views on the challenges the HVACR industry is facing. Dina Koepke: My name is Dina Köpke, I am working as Director of Governmental Affairs within Emerson Climate Technologies, it is one of the divisions of Emerson. Emerson is a conglomerate, we make 22 billion sales in US dollars per year. The Emerson Climate Technologies area is making above 4 billion sales, and Emerson Technologies in Europe, where I am located and working for, is about 320 million euros. My field is government affairs, so I am working a lot for different associations, with different policy officers and national policymakers. EPEE Secretariat: Why is Emerson a member of the European Partnership for Energy and the Environment (EPEE)? 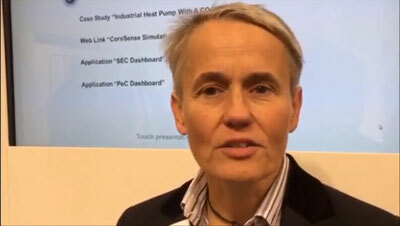 Dina Koepke: Emerson Climate Technologies decided to join EPEE already at the very beginning of its inauguration because the cooperation of all the industry players in heating, cooling and air conditioning is extremely important concerning the F-Gas topic, and as well concerning all the energy efficiency issues that are very important for us as an industry and as well as a society on a global level. In Europe, EPEE is the dominant player and at the same time is very good in liaising with other regions such as the US and Asia in order to understand what is the best solution in the long term on a global basis and what we must do to achieve changes for our environment and ensure health and safety for our people in the future, for our children and grandchildren. EPEE Secretariat: What are, according to you, the big challenges that our industry is facing? Dina Koepke: One of the biggest challenges is the energy efficiency and the collusion aspect that we are facing globally and on a regional level. In Europe, we are in a lucky situation as we have a rather nice environment because we were able to spend already quite a bit of money in making it nice and beautiful. We need to improve that further so it is quite a challenge to make everything even better, more efficient and more environmentally-friendly. But at the same time we have to impact on a global level as well. What we do in Europe here will hopefully find its place as well in other regions so that they do not have to go through the learning curve that we went through but hopefully can get to solutions very quickly. And this is the most difficult challenge because a lot of the other regions are in very dire economic conditions. It is going to be a real challenge and I think it is the biggest and long-term challenge that all of us face in this industry. EPEE Secretariat: This year, EPEE and EVIA are partnering to organise EUREKA 2016. Why do you think the event will be a good platform to address these challenges? Dina Koepke: EUREKA will be a good platform because all the government players will be there, we will have visitors from the industry, different associations, NGOs, policy officers, officials… Therefore it will be a good platform to exchange information to see where we are at and to have discussions on what can be done and how we can approach it. If we do not cooperate well we are not getting anywhere and we need theses platforms to start to move the tanker towards a new direction and achieve our goals.